This is YOURBAN’s first project, and it is a monumental display, located in Via del Porto Fluviale (Ostiense), Rome. Created by international artists Iena Cruz - this project forms part of an already renowned and impressive portfolio of brilliant street art. Lena’s artwork places strong emphasis on environmentalism. This project at Ostiense marks the start of greater public awareness about environmentalism within an urban setting. The aim of this project is to work in collaboration with international artists to increase the potential and scope of YOURBAN2030. 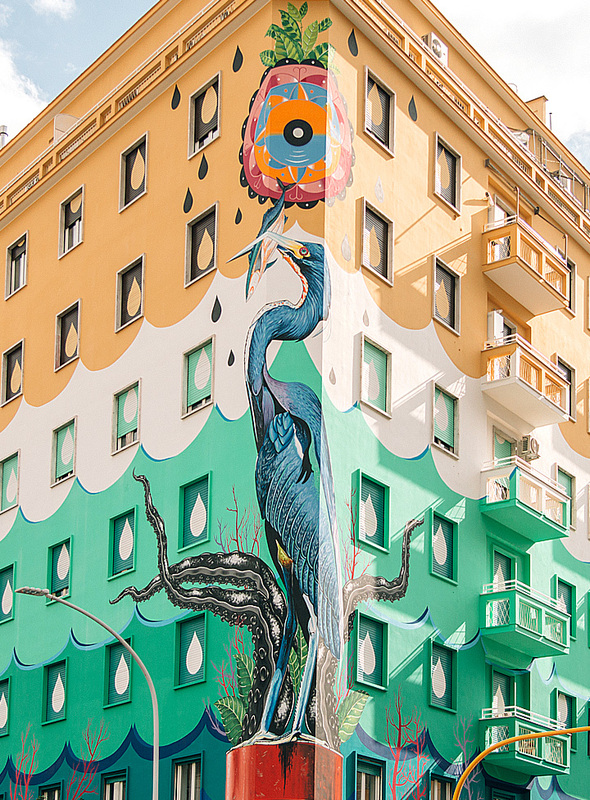 We believe that we can emulate the same idea as the mural on Via del Porto Fluviale. Also, to develop ideas around how art can be used to promote environmental sustainability. 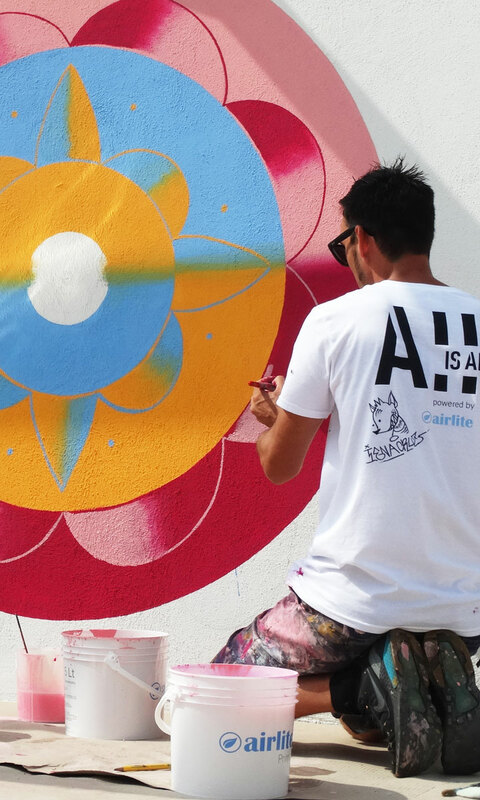 This mural is made using a special eco-paint that can actually break-down atmospheric pollutants. This is possible thanks to a particular chemical process in the paint where pollutants are essentially captured and removed from the air, and purifying in a natural way. The name of this revolutionary technology is called Airlite, which is available to everyone to use. Tests show that Airlite may reduce air pollution by up to 88.8%, and can also eliminate bacteria from surfaces, and repel dust and neutralize odors. It is a truly impactful solution. Consider this quick example: a surface space of 100m2 (one hundred meter squared) painted with Airlite has the same positive impact in terms of air quality than 100m2 of forest. This solution is sustainable in two distinct ways: in the medium (paint) and in the message (art). 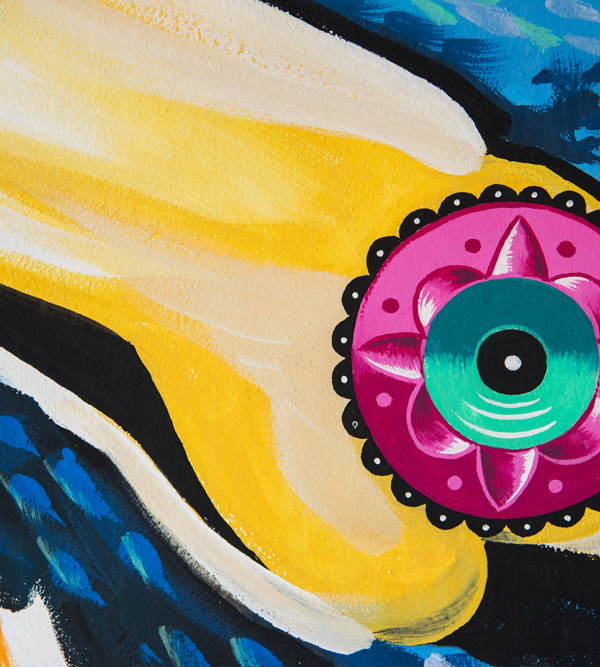 A globally recognized muralist, contemporary artist, and set designer. Federico Massa was born in Milan. During 1990s, he used the street alias Cruz, and later using Iena Cruz. Massa not only creates striking murals in Rome, but also around the streets and neighborhoods of Bushwick and Williamsburg in Brooklyn, it’s possible to view many more murals bearing his name, all of which has helped to establish Massa as a world-class artist. Massa has a great deal of interest in conservation, and he often includes spectacular animals in his art, and typically at large-scale and across complex surfaces such as apartment buildings, where there are windows and gaps to contend with, but always ensuring the success of the overall painting. His murals are a real testament to his skills and abilities. A step-by-step look at how the project was developed, including the rise of scaffolding through to the formation of shape and colour. This docudrama, by Riccardo Rabacchi, follows the development of Iena Cruz’s work. Filmed in the Ostiense quarter, it provides a captivating insight into the making-of the art work while also allowing the opportunity to deepen our understanding of the techniques and methods used to create such monumental art. The Ostiense district is well-known as the area for street art, a sort of open-air art museum through which we can hear the voice of each inhabitant. Hunting Pollution aims to highlight the potential for a new approach to urban art. Image Hunters is a newly formed production company specializing in audio/visual production for film and television and advertising. Founded in 2007, the company is managed by professional media producers - all of who are under 35 years of age. Since its founding, the company has established itself as being on the forefront of cinematic visual style and cinematography. Additionally, they have won numerous prizes in recognition of cinematography and narrative - including the David di Donatello, 2 nominations for the Nastri D’Argento prize, along with participating in the famous Cannes Festival. Image Hunters aim to contribute to and promote cultural development through initiatives such as: Rome Creative Contest, Shortsleauge, Cinema Italian Style, and Spring Shorts.